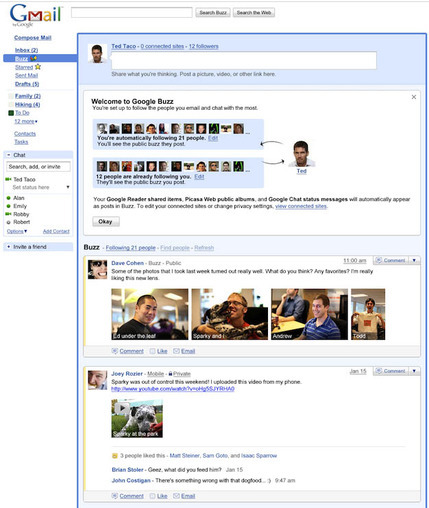 Google’s new social networking site Buzz launched last night and bills itself as the best way to “share interesting stuff”. On Google’s official blog they claim that Buzz will be a way of “organizing the social information on the web” and “finding relevance in the noise”. So is this a generous contribution to information flow and “sharing” or is it a massive swipe at Facebook, the world’s most popular social network and Google’s rival? I think we can take it as a swipe at Facebook. And duplicating what Facebook does is going to create way more noise, rather than less. The thought of yet another stream of status updates makes me slightly weak inside, and I love social media. I’m not that creative godammit. Buzz builds out of Google’s successful email service – Gmail, giving it an automatic 170 million users….But much more than just adding a new feature to an email service: it really pushes Google directly into social network territory. Is Google really that petty? I think it’s a little more genuine than people have given Google credit for. Facebook only gives you info from Facebook. Buzz gives you info from everywhere.